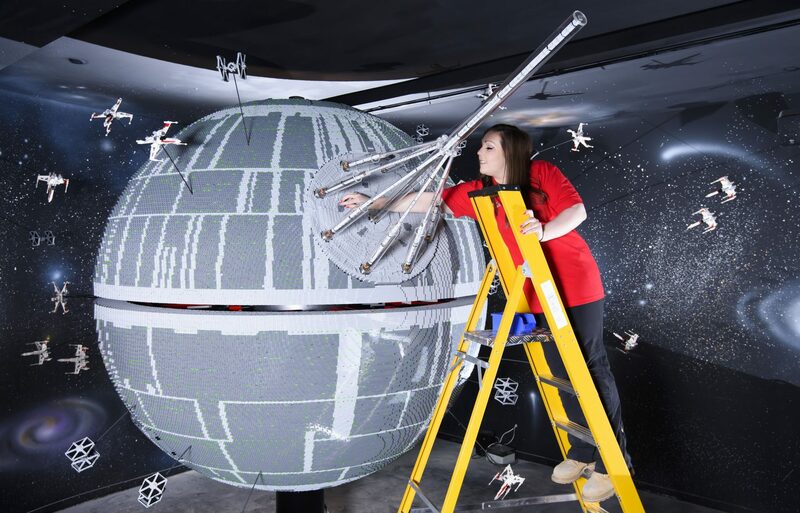 One of the most impressive and biggest LEGO® Star Wars™ models Ever created – a 500,000 brick LEGO® Star Wars™ recreation of The Empire’s ultimate super weapon, The Death Star – has been installed at the LEGOLAND® Windsor Resort. The operation took three days as the massive new 2.4 metre wide, 3 metre high creation was carefully hoisted into position and the final bricks and scenes were put in place. 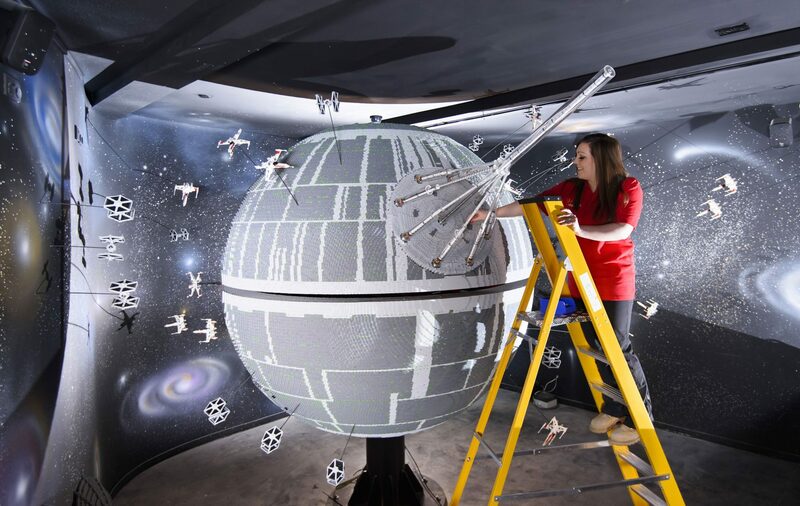 The hefty 860kg perfectly spherical model took 15 Model Makers three months to build and will be the centrepiece of an epic new finale at the LEGO®Star Wars™ Miniland Model Display when the Resort opens on 11 March. 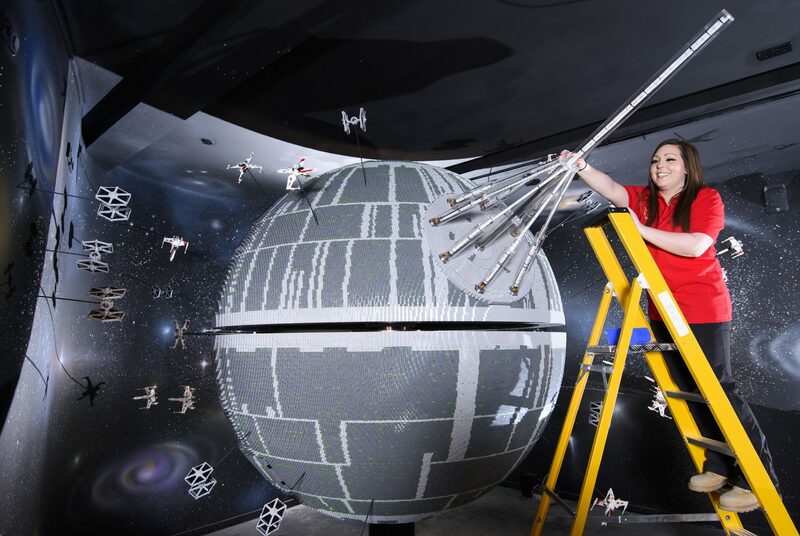 ONE OF THE WORLD’S BIGGEST EVER LEGO® STAR WARS™ MODELS INSTALLED AT THE LEGOLAND® WINDSOR RESORT. LAST PIECES PUT IN PLACE IN NEW LEGO® Star Wars™ Miniland Model Display Finale. 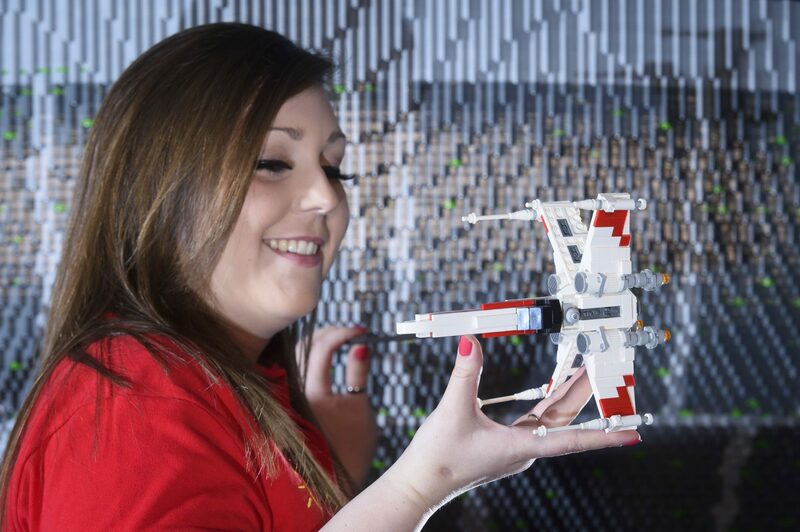 LEGOLAND® Model Maker, Phoebe Rumbol, puts the finishing touches to one of the Rebel Alliance ships featured in a new finale scene to the Resort’s LEGO® Star Wars™ Miniland Model Display. 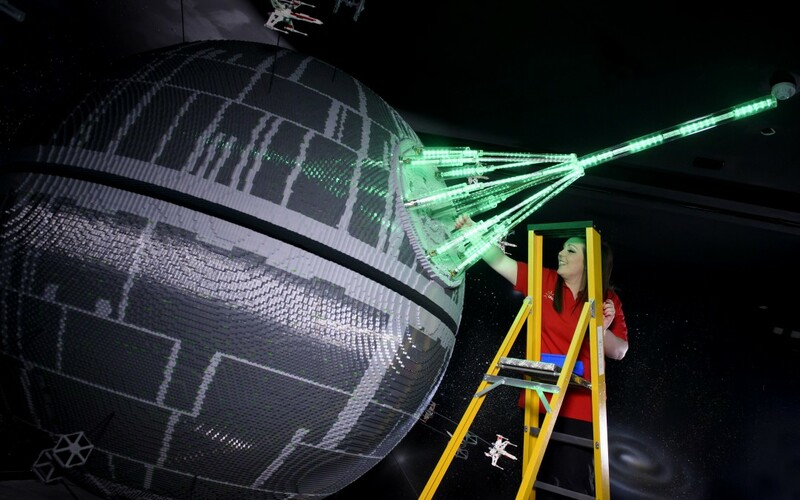 This is one of the smaller elements to the 651,086 brick scene and the centre piece is one of the most impressive and biggest LEGO®Star Wars™models ever created – a 500,000 brick LEGO®Star Wars™ recreation of The Death Star. The models were installed in a mammoth operation that took three days as the massive new 2.4 metre wide, 3 metre high creation was carefully hoisted into position and the final bricks and scenes were put in place. The hefty 860kg perfectly spherical model took 15 Model Makers three months to build and guests can trigger special effects and bring the scene to life when it opens at the Resort on 11 March. 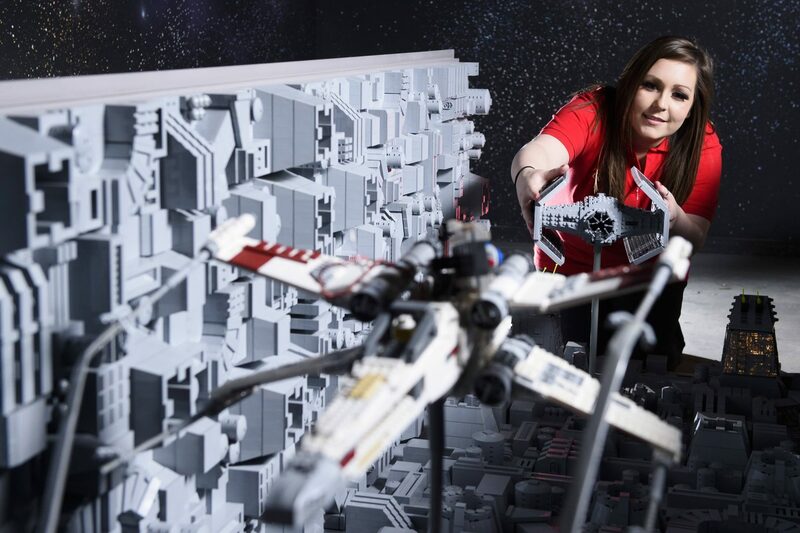 LEGOLAND® Model Maker Phoebe Rumbol, puts the finishing touches to some of the Rebel Alliance ships featured in a new finale scene to the Resort’s LEGO® Star Wars™ Miniland Model Display. This is one of the smaller elements to the 651,086 brick scene and the centre piece is one of the most impressive and biggest LEGO® Star Wars™ models ever created – a 500,000 brick LEGO® Star Wars™ recreation of The Death Star. The models were installed in a mammoth operation that took three days as the massive new 2.4 metre wide, 3 metre high creation was carefully hoisted into position and the final bricks and scenes were put in place. The hefty 860kg perfectly spherical model took 15 Model Makers three months to build and guests can trigger special effects and bring the scene to life when it opens at the Resort on 11 March. 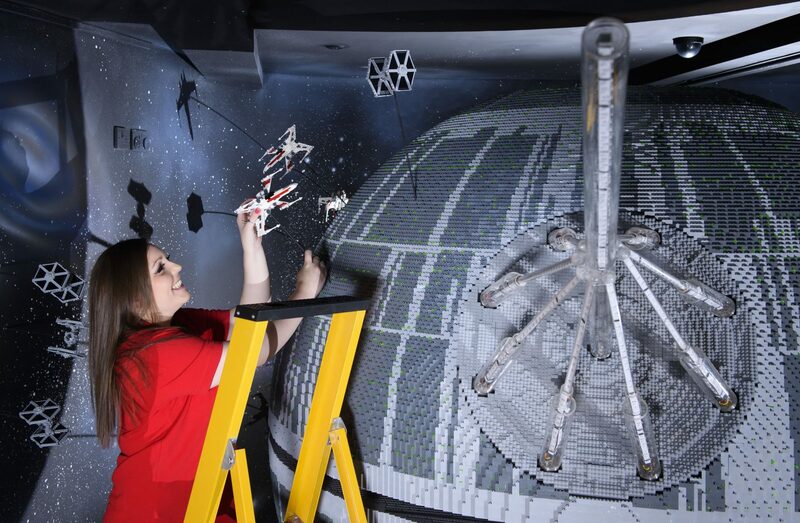 LEGOLAND® Model Makers Giorgio Pastero and Phoebe Rumbol lift the top piece into place, onto one of the biggest and most impressive LEGO® Star Wars™ models ever created – a 500,000 brick LEGO® Star Wars™ recreation of The Death Star. The operation took three days as the massive new 2.4 metre wide, 3 metre high creation was carefully hoisted into position and the final bricks were put in place. The hefty 860kg perfectly spherical model took 15 Model Makers three months to build and will be the centrepiece of an epic new finale at the LEGO®Star Wars™ Miniland Model Display when the Resort opens on 11 March and guests will be able to trigger special effects and bright the scene to life. 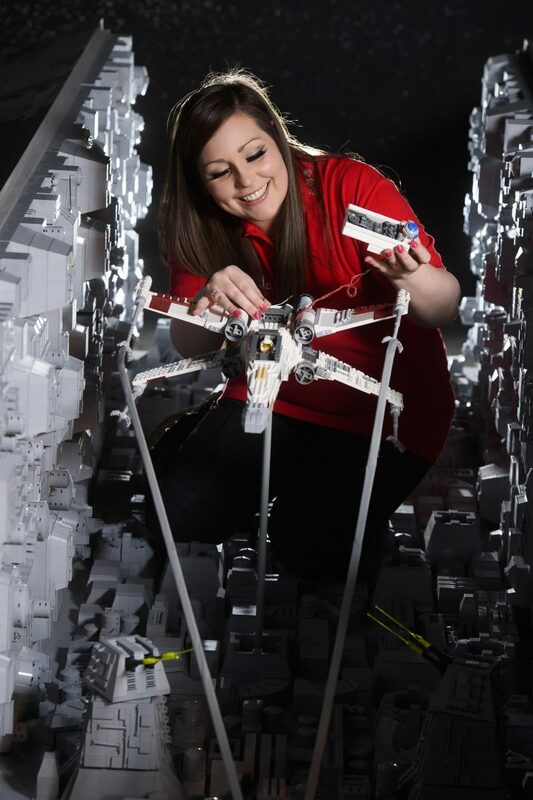 LEGOLAND® Model Maker, Phoebe Rumbol, puts the finishing touches to one of the Rebel Alliance ships featured in a new finale scene to the Resort’s LEGO® Star Wars™ Miniland Model Display. Featuring one of the most impressive and biggest LEGO® Star Wars™ models ever created – a 500,000 brick LEGO® Star Wars™ recreation of The Death Star. The models were installed in a mammoth operation that took three days as the massive new 2.4 metre wide, 3 metre high creation was carefully hoisted into position and the final bricks and scenes were put in place. The hefty 860kg perfectly spherical model took 15 Model Makers three months to build and guests can trigger special effects and bring the scene to life when it opens at the Resort on 11 March. 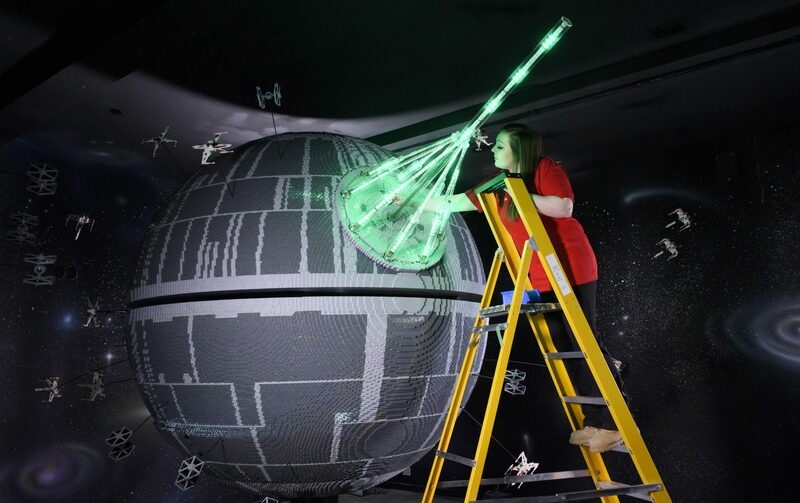 ONE OF THE WORLD’S BIGGEST EVER LEGO® STAR WARS™ MODELS INSTALLED AT THE LEGOLAND® WINDSOR RESORT. LAST PIECES PUT IN PLACE ON 500,000 LEGO® BRICK DEATH STAR. 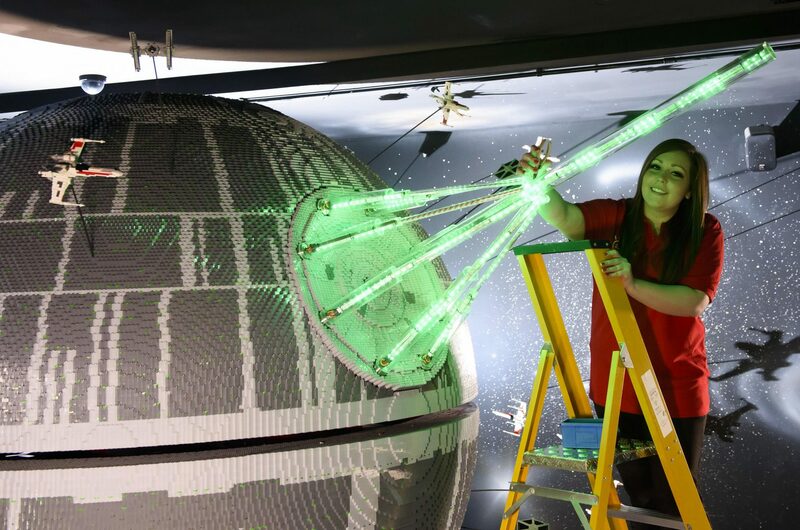 LEGOLAND® Model Maker, Phoebe Rumbol, puts the finishing touches to one of the most impressive and biggest LEGO® Star Wars™ models ever created as a 500,000 brick LEGO® Star Wars™ recreation of The Death Star is installed in a new finale to the Resort’s LEGO® Star Wars™ Miniland Model Display. The operation took three days as the massive new 2.4 metre wide, 3 metre high creation was carefully hoisted into position and the final bricks were put in place. The hefty 860kg perfectly spherical model took 15 Model Makers three months to build and guests can trigger special effects and bring the scene to life when it opens at the Resort on 11 March. 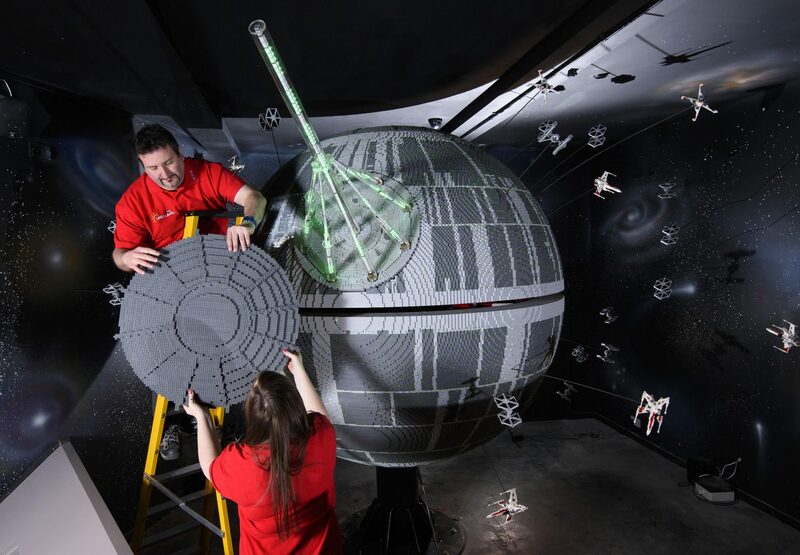 ONE OF THE WORLDS BIGGEST EVER LEGO® STAR WARS MODELS INSTALLED AT THE LEGOLAND® WINDSOR RESORT. LAST PIECES PUT IN PLACE IN NEW LEGO® Star Wars Miniland Model Display Finale. 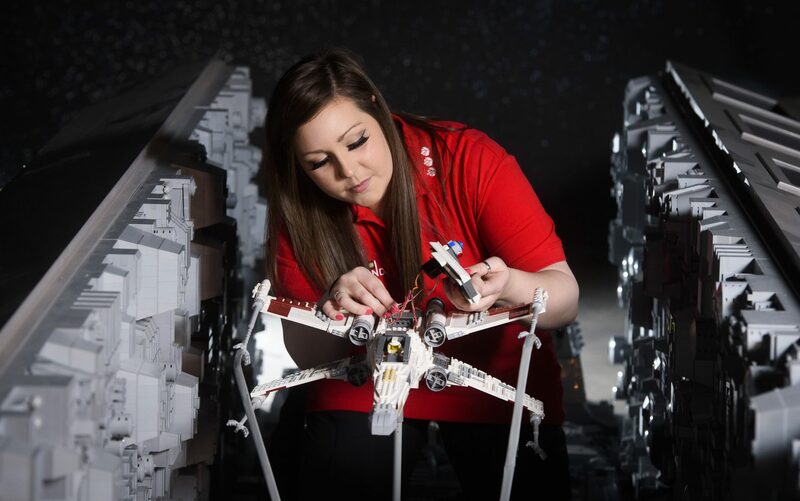 LEGOLAND® Model Maker Phoebe Rumbol, puts the finishing touches to some of the Rebel Alliance ships featured in a new finale scene to the Resorts LEGO® Star Wars Miniland Model Display. This is one of the smaller elements to the 651,086 brick scene and the centre piece is one of the most impressive and biggest LEGO® Star Wars models ever created – a 500,000 brick LEGO® Star Wars recreation of The Death Star. The models were installed in a mammoth operation that took three days as the massive new 2.4 metre wide, 3 metre high creation was carefully hoisted into position and the final bricks and scenes were put in place. The hefty 860kg perfectly spherical model took 15 Model Makers three months to build and guests can trigger special effects and bring the scene to life when it opens at the Resort on 11 March. 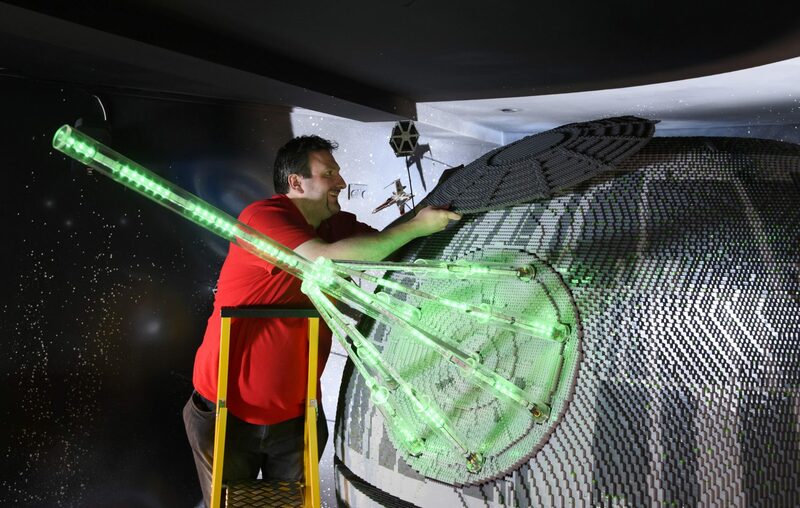 LEGOLAND® Model Maker Giorgio Pastero lifts the top piece into place, onto one of the biggest and most impressive LEGO® Star Wars™ models ever created – a 500,000 brick LEGO® Star Wars™ recreation of The Death Star. The operation took three days as the massive new 2.4 metre wide, 3 metre high creation was carefully hoisted into position and the final bricks were put in place. The hefty 860kg perfectly spherical model took 15 Model Makers three months to build and will be the centrepiece of an epic new finale at the LEGO®Star Wars™ Miniland Model Display when the Resort opens on 11 March and guests will be able to trigger special effects and bright the scene to life.